When was the last time someone gave you theirs? It might seem that with the spread of digital communication, business cards will soon be a thing of the past. But we think that physical business cards are not a dying breed just yet. Even with the possibility of exchanging contact details on your phones when you meet someone, handing each other a unique business card can still be a memorable experience. We’re not talking about a boring, default business card though. For a business card to be memorable it needs a certain visual or tactful spark. Fortunately, this isn’t an impossible task. Creating a unique business card for your startup or small business is quite simple. With the amount of high-quality templates available in programs like Visme, much of the guesswork is taken care for you. And with printers that offer lots of choices for unique finishings, you can make a business card in no time. A great way to start any design, and something even designers do, is to get visually inspired first. 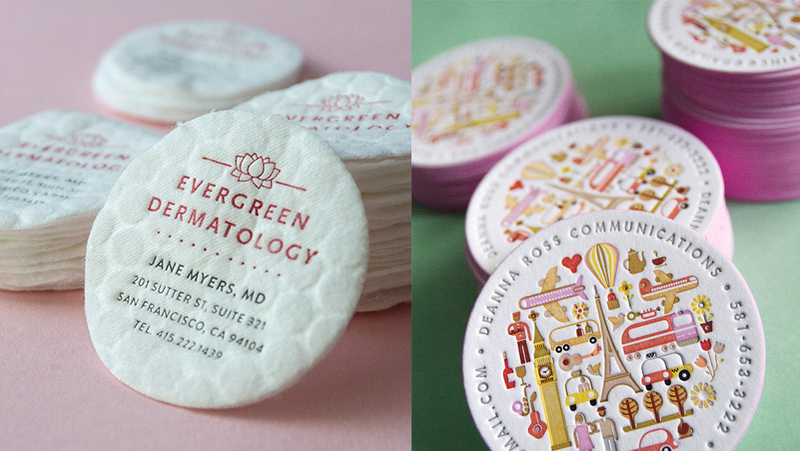 A while ago we published a round up of 60 eye-catching business card examples. You could start scrolling through that first. Every single design in that round up is stellar and a wonderful source of inspiration. Don’t just look at the amazing designs though, look for some business card fails as well! Look at the business cards below. The ones on the left are definite fails, and the ones on the right are cards from companies in the same niche but with a great result. This card could be labeled as minimal, but the problem is that it’s so minimal it’s boring and uninspiring. There is nothing about this card that calls your attention apart from the fact that it’s white text on black background. The card on the right, though, is also black and white with a relatively minimal design. But the front has a lineal illustration of a vintage camera, an image that will grab the receiver's attention. The back of the card has only the most relevant information and that’s it! To the point and memorable, all in one design. If you take a minute or two and search for “bad business cards,” the one on the left is one of the first images that pops up. It’s not hard to see why. First off, why a wolf? Nobody knows. Second, does the card even make you think of web development? There are too many fonts and the company name initials are “BAD.” Bad all around. The card on the right, instead, got things right. The logo is interesting and memorable, it looks a little bit like code. The other side has the information along with some subtle code snippets, creating a back-end / front-end visual metaphor. Another way of getting your card labeled as a fail is to be completely inappropriate. There is no rule against including a photo of yourself on your card, but better choose the right photo. The realtor on the left chose a photo of himself in a tennis outfit, taken inside a house. Would you hire him? We wouldn’t. And now his card is one of the favorites in business card fail universe. The card on the right looks a lot more professional and it also includes a photo. The design is also much crisper. 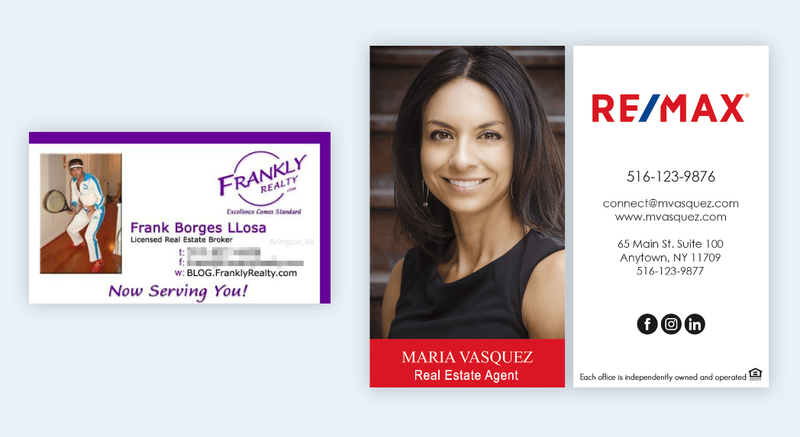 I think I want to buy a house from Maria instead of Frank. What about you? Before starting your new business card design, make sure you have all the information listed on a document or notebook. Once you have the list ready, open up your brand style guide. If you have been using Visme for a while, then you probably have the brand kit filled in. If so, then the designing will be a lot easier. The idea is that you stay on brand! Here are some practical visual tips to consider while you are finalizing your design. A business card needs to make a good impression at first sight and touch. When you hand your business card to someone, they must feel compelled to look at it. If they put it in their pocket without a second look, you’ve failed at a good first impression. You literally have a second or two, at most, to impress. This doesn’t mean you need to create a card that is so over the top that it embarrasses you. The thin line between a memorable card and a terrible card lays in the design, the material it’s printed on and the shape it has. If irregular shapes and special papers don’t fit in your budget, you can create a memorable card in the standard shape with a unique design approach. For example, a “spot UV” or “raised spot gloss” effect can give that little extra texture to your cards that will make a great first impression through touch. The very uneventful card on the left has a standard layout and doesn’t grab your attention at all. Since it’s probably printed on regular paper, the feel of it in your hand has no effect either. Straight to the pocket and eventually the trash. The card on the right has a spot UV effect in a splash design, plus a lively color. A double whammy to the senses. This kind of card gets pinned to bulletin boards. Clutter is an instant killer to any visual project. This is one of the most important tips for all kinds of design. 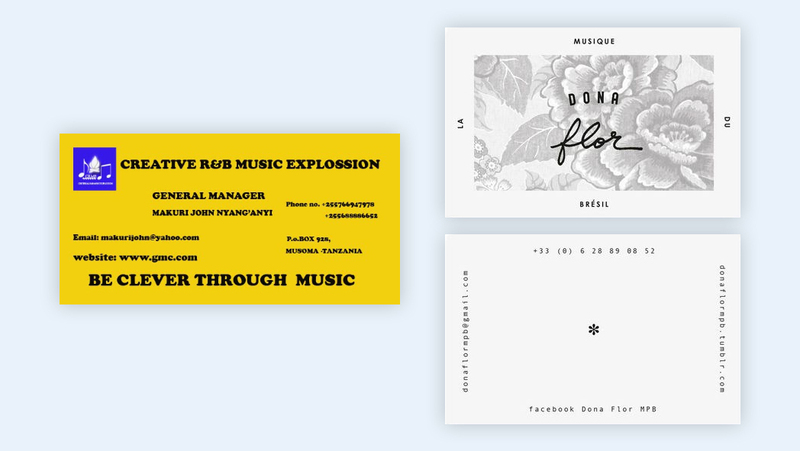 For business cards in particular, its specially important since the space is so limited. 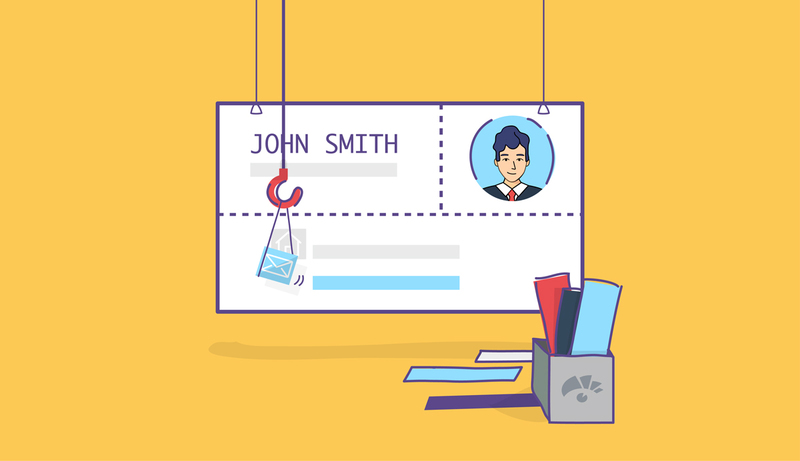 The most important details to include are obviously your name, your company name, your title and a way to contact you. Everything else is an added bonus and you should pick with caution which to include. For example, a card with all the details + a photo + a qr code + lots of social media profiles would instantly look cluttered. The card below has way too many photos and the text is too long. Not only that, the top section has too many colors. There is just too much going on. The card on the right is also full visual information but is not cluttered. It’s all about balance. Balance is your best friend when designing a business card. Keeping things balanced is also the best way to avoid clutter. One way to keep things balanced is to follow a simple grid. This doesn’t have to be complicated. If using Visme, you can choose the “snap to objects” button in the view options. This means that all the elements are aligned respectively with each other. The card on the left below has problems with the spacing between elements. There is no clear direction as to what section to read first. The background color is also very bright and distracting. This is NOT a balanced card. The card on the right took a unique approach in the way the elements are placed, yet they are very in balance with each other. Finding your uniqueness is a good way to make business cards stand out from the rest. Simple details like rounded corners, embossed logos and metallic inks can give your cards that visual spark to make a unique first impression. More extreme options are cards made from thin metal sheets or transparent mica plastic. For an even more unforgettable experience, you can make cards into magnets or cut them into interesting shapes. The examples below are of extreme card designs that really took a unique approach and rolled with it. Creating a card with Visme is easy. There are plenty of templates to choose from in the standard business card size. If you follow the next steps, you can easily create a great business card, even with minimal design skills. Remember that a template is a guide and not a design set in stone. Choose one of the templates in the template library. Pick one that grabs your attention quickly. Follow your brand guide (or brand kit) and information checklist to fill in the information in the template. Use your fonts, colors and textures to set up all the information in a nice composition. 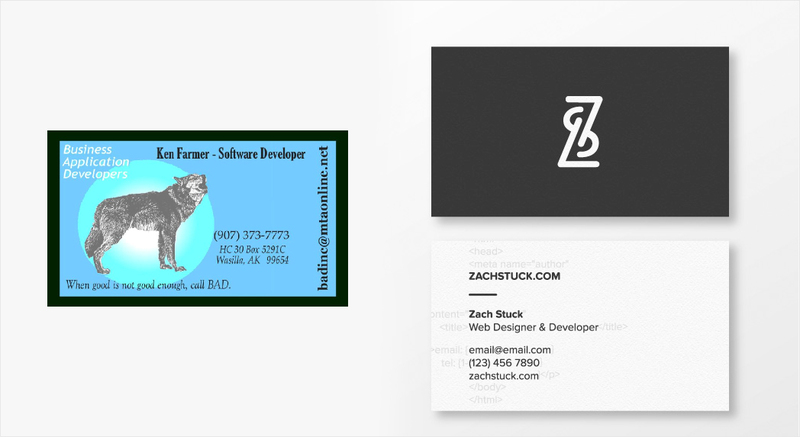 All the business card templates on Visme have two sides. In the editor they are called “slides.” It’s up to you to decide if you want your card to have one side or two. We think a two sided card is more powerful because one side can be really visual while the other is more about the information. If you need some help with composition, you can check out our guide on how to add text to images. There is plenty of tips on margins, line height, spacing and contrast. While you are designing the card, try a couple different drafts before deciding it’s finished. In Visme, you can do this by duplicating a slide and changing the elements around. When you try out different compositions, you will have a better idea of what looks and works better. Show the different possibilities to your team members, or friends if you are solopreneur, and get some valuable feedback. There are some great Facebook groups for solopreneurs looking for advice on all sorts of aspects of business, including business card designs. Once you’ve decided on the final design, it’s time to get it ready for the printers. Save your card as a PDF file with bleed marks and start communicating with your favorite printers. There are three ways to get your cards printed. The first two are definitely the best options. We don’t recommend you print the cards yourself. Not only because of the unexpected results in print quality, but also because you’d have to cut them too. Sending your cards to be professionally printed doesn’t have to be ridiculously expensive, it all depends on the paper and finishings you choose. So, find a printer either locally or online. If you really want to know what the papers look and feel like, visit their print shop and actually touch the different papers. The people at the print shop will tell you the prices for the different papers and finishings. At this point you can analyze your budget and figure out what you can afford. Get the most unique combination that matches your brand and fits your budget. 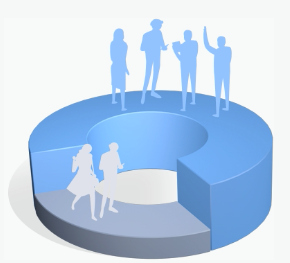 If you are going to use an online printing service, the process is more automated. Vistaprint and Moo are two great online printing options. Both of those websites give you choice of paper and finishings. 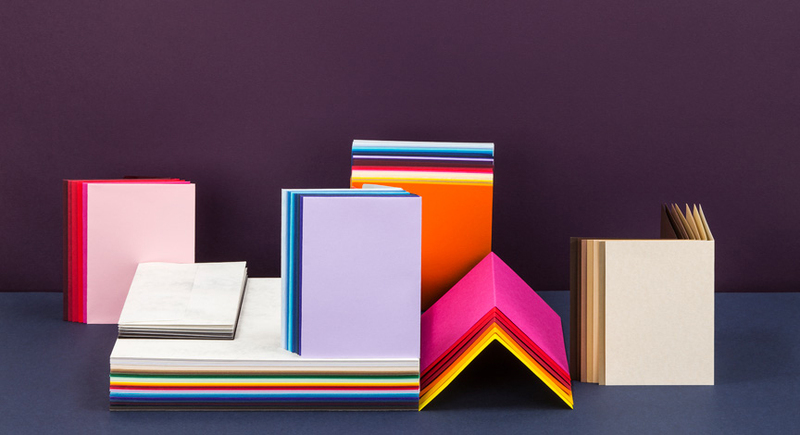 Once you have picked the combination you like, the website gives you a price calculation and you can either go ahead and upload your design or choose another paper and finishing combination which fits your budget better. Order your cards and wait impatiently until they arrive. Online printing services also have templates available for you to use, in the next section we will look at how to make a business card with an online printer. If you don’t find a template on Visme that you like, or are thinking of creating cards with a unique shape or finish, then your best bet is to create a card with an online printer. 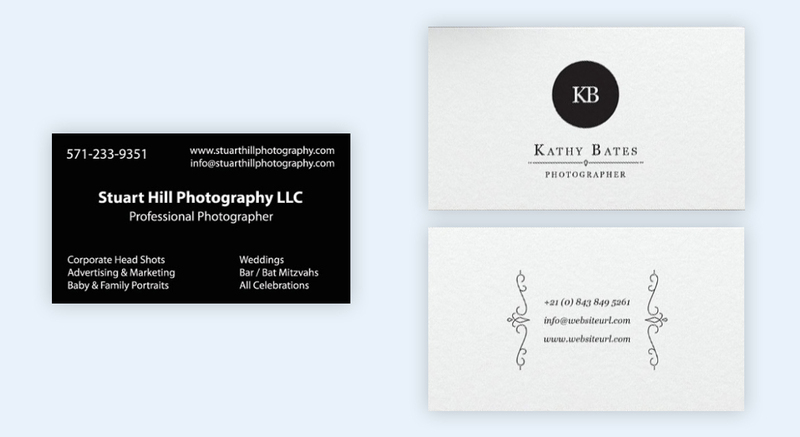 Like I mentioned before, Moo and Vistaprint are great options for professional looking cards. PsPrint offers cards in special shapes which you can either pick from their database or upload your own. You can pick the type of paper, the shape and the texture before or after filling in the template with your brand assets. The websites will calculate the cost as you pick the combination you like. Here are the steps to take when creating a business card with an online printer. Choose one of the three online printing sites and pick a template to use for your new cards. Add your details to the template. Upload your logo, use your colors and textures. If the editor in the website doesn’t have your fonts, you will have to upload your own design anyway. Rectangular business cards can be unique with special finishings like rounded corners or spot UV details. 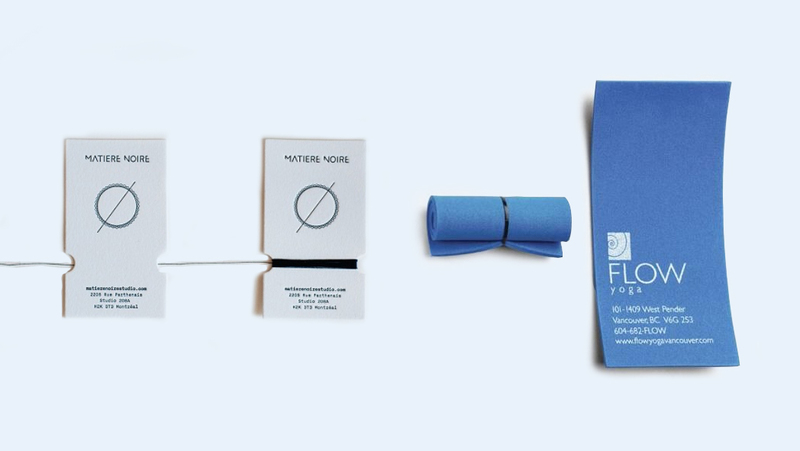 A square or round business card is unique simply by being that odd shape. But there are other types of unique business cards that really go way further. Remember what we mentioned in the “find your uniqueness” section above? To create a really unique business card you might have to hire a designer. All the online printing websites we mentioned above, offer designer services. For a specialty shaped business card, visit a site like PsPrint. Really unique business cards will definitely cost a lot more than a standard card, but sometimes it really is worth it. If you like the idea of a metal business card for example, visit My Metal Business Card.They even offer metal cards with a groove to use as a bottle opener. Since the uniqueness in metal cards is the metal itself, designing them is not complicated. You can still use the Visme templates to design your own. Rock Design offers acrylic and carbon fiber business cards. Plasma Design has wooden cards with die cut designs. Jukebox offers 3D embossing and mega thick cards. Decide exactly with kind of unique card you want and find the appropriate service provider. Ask the printing service to send you the design guidelines so that you can create the design with Visme or your favorite graphics editor. Most websites have this readily available and may also have it as a template format. Upload or send your design. Order your cards and twiddle your fingers until they arrive. What do your business cards look like? If it’s time to renew your cards, why not take a few of our tips into consideration and create your own memorable business card. Yes, you can do it even without design skills. Thanks for the feedback, Ruben. We’ll look into that. This is a very good how-to. Although, I use Business Card Maker software to create my business cards, I’ll take some designer ideas I’ve learnt from your guide. Hi Jessica. Even with the Business Card Maker, you can take some tips yes. Especially if your content doesn’t fit into their templates perfectly! You can also try designing them in Visme and importing the design to the Business Card Maker. Good luck! Great, thanks for creating this awesome article. It gives me ideas from your guide. Thank you for this one. You are very welcome! We hope all your business cards come out great!